Is Donald Trump not merely gullible, uninformed, and indifferent but actually treasonous when it comes to Russia? More and more high-profile people are saying so. He’s acting like “a Russian mole,” in the words of conservative columnist Max Boot (www.washingtonpost.com/opinions/global-opinions/trump-is-pushing-the-atlantic-alliance-to-the-breaking-point/2018/06/30/c054f0dc-7c8e-11e8-80be-6d32e182a3bc_story.html). “America is under attack and its president absolutely refuses to defend it. 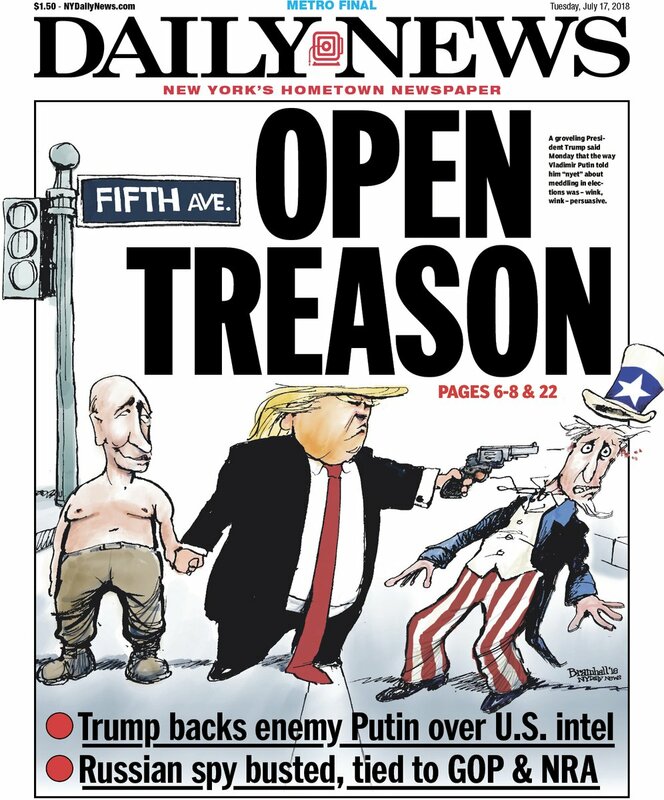 Simply put, Trump is a traitor and may well be treasonous,” argues New York Times op-ed writer Charles M. Blow (www.nytimes.com/2018/07/15/opinion/trump-russia-investigation-putin.html). The former CIA director, John Brennan, tweets that “Donald Trump’s press conference performance in Helsinki rises to & exceeds the threshold of ‘high crimes & misdemeanors.’ It was nothing short of treasonous” (https://www.cnn.com/2018/07/16/politics/john-brennan-donald-trump-treasonous-vladimir-putin/index.html). And John McLaughlin, former acting director of the CIA, calls Trump an “agent of influence” for Russia (MSNBC interview, July 16, 2018). Indeed, one writer reviews the evidence and invites us to consider that Vladimir Putin is Trump’s handler (http://nymag.com/daily/intelligencer/2018/07/trump-putin-russia-collusion.html). And that piece was written before the Helsinki summit. But today, July 19, 2018, we have a mindboggling report from the New York Times (www.nytimes.com/2018/07/18/world/europe/trump-intelligence-russian-election-meddling-.html) that Donald Trump was informed, two weeks before his inauguration, that the US government had rock-solid evidence of Russian interference, directed by Vladimir Putin, to sway the election. CIA director Brennan was one of the briefers on that occasion. So was James Comey. •	Blaming his own country for problems with Russia: “Our relationship with Russia has NEVER been worse thanks to many years of U.S. foolishness and stupidity and now, the Rigged Witch Hunt!” Trump tweeted on July 15. •	Making every effort to undermine the Mueller investigation, with attacks on the credibility and even patriotism of his own justice department and FBI. •	Inviting Russian interference during the campaign: “Russia, I hope you can find the 30,000 [Clinton] emails that are missing.” Russian hacking began the same day. •	Showing no concern about Mueller’s indictments of Russian intelligence officers and some 20 other Russians, nor about the five guilty pleas (so far) of top officials in his campaign and administration. •	Indicating no interest in strengthening sanctions on Russia despite support from within his own administration, and a large majority in Congress, for sanctions. •	Never criticizing Putin’s authoritarian rule and the ongoing crackdown on his journalist, politician, and business critics. •	Going ahead with a summit meeting with Putin that lent legitimacy to Putin’s rule, allowed Putin to easily dismiss election hacking and indictments of Russians, yet offered no concrete indication that any of the other issues dividing the US and Russia—such as strategic weapons, Syria, North Korea, the Iran nuclear deal, military deployments, and trade—had been resolved, ameliorated, or even seriously discussed. •	Undermining European unity and US-European ties, such as by starting a trade war with Europe, which Trump accuses of robbing from the US “piggy bank”; questioning the usefulness of NATO, which he says is “as bad as NAFTA”; questioning the EU, which he says “was set up to take advantage of the United States” and is an economic “foe”; and interfering in European politics, such as by criticizing Theresa May’s Brexit negotiations and Angela Merkel’s liberal immigration policy. It is almost beyond belief to think that the president of the United States might be doing Russia’s bidding. We’re a democracy, we have constraints on illegal and treacherous conduct, no one can get away with secretly serving another government for very long—right? But remember: We were warned by fifty senior Republican figures in the national security establishment early on in Trump’s presidential campaign that he was unfit to be president and commander-in-chief. * Their concerns were on the money. Yet there was no way anyone could have imagined the depths to which Trump has brought us—the facts and circumstantial evidence that point to impeachable offenses: “high crimes and misdemeanors” and “aid and comfort” to Russia, which the National Security Council has identified in its 2017 strategic paper as the principal threat, along with China. “America First” seems to mean not just “American Alone” but “Russia first”: Trump is systematically undermining all the pillars of US national security and global responsibility—specifically, support of traditional allies, defense of the republic from foreign interference in our political process, and commitment to human rights, the rule of law, and diplomacy. Just about every policy move Trump has taken in Europe and the Middle East is in Russia’s interest. This conclusion is not to suggest that ameliorating US-Russia tensions is a bad thing; to the contrary, finding common ground with Russia on further reductions of nuclear weapons, nonintervention and power transition in Syria, protecting the global environment, and preventing election hacking would be fine. (See http://www.foreignaffairs.com/articles/russian-federation/2018-07-11/surprising-promise-trump-putin-summit for a well-reasoned argument on engaging Russia.) Problem is, neither Trump nor Putin is seriously interested in tackling any of those issues. Take back the Congress to disempower Trump. I’ve assumed that Trump’s demands that NATO countries increase military spending is primarily an effort to sell them more US manufactured arms. Is that correct? Thanks. Always appreciate your insights. You’re correct, Jerry: Trump in fact said that the US makes the best weapons and hoped NATO members would buy more of them. So demanding that NATO spend more for “defense” translates into buying more from the military-industrial complex. Well-written commentary about a sad state of affairs, my friend. With each blatant infraction of basic governmental principle or basic sense of compassion, I keep thinking “THS is it. Finally, members of congress — regardless of political bent — will say ‘enough is enough. '” And yet here we are a year-and-a-half later still watching a capital filled with purposeful ambiguousness. John Brennan is unlikely to find many “Republic Patriots” standing tall in Congress but that doesn’t mean all hope is lost. Congressional Republicans can count and one thing they understand very well is that despite all else, their constituents remain irrationally mesmerized by Trump and his minions. But Trump’s performance in Helsinki may yet turn out to be his undoing. It wouldn’t be at all surprising if we began to see some leakage from the US Intelligence Community’s Trump File as pushback for having scorned them too often and too harshly. Stay tuned.